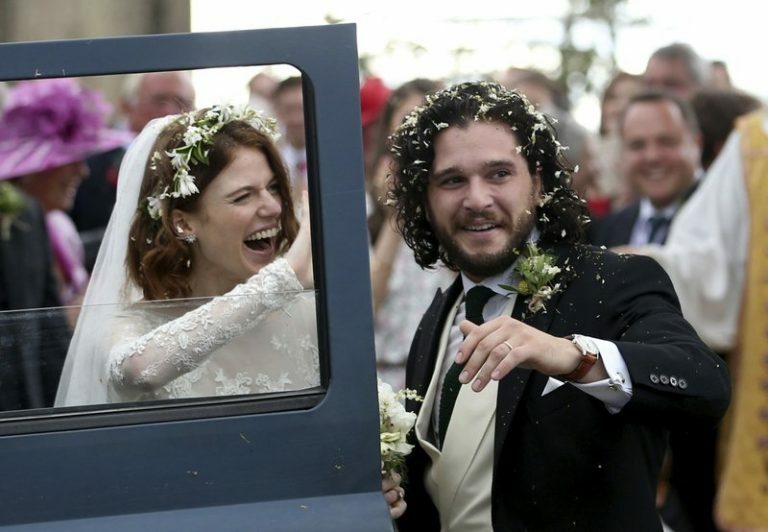 LONDON, June 24: Former “Game of Thrones” co-stars Kit Harington and Rose Leslie married Saturday with a church service and a celebration at the bride’s ancestral castle in Scotland. The couple and guests arrived for the afternoon service at Rayne Church, close to the 900-year-old Wardhill Castle in northeast Scotland, which is owned by Leslie’s family. Harington, wearing a morning suit, and Leslie, in a flowing ivory gown and veil, smiled at members of the public who had gathered outside the church. Guests included the pair’s “Game of Thrones” co-stars Peter Dinklage, Maisie Williams, Sophie Turner and Emilia Clarke. Later the newlyweds were showered with rose petal confetti as they left the church and drove off in a Land Rover festooned with “Just Married” signs to a reception on the castle grounds. The couple announced their engagement with a notice in the Times of London newspaper in September. The bride’s father, Sebastian Leslie, said Saturday he was “absolutely thrilled” about the wedding.